It was a strong performance over the 90 minutes for Well, but the Canadian midfielder wasn’t made to work hard for his goals thanks to some sloppy mishaps in possession. The game enjoyed a frenetic opening, with Well on top in the early exchanges. Jake Hastie was the first to enjoy a half-opening when he flashed a header well wide on ten minutes, before Tom Aldred planted a back post header over the bar from Turnbull’s corner. But Rangers were to claim the opening goal after 22 minutes after Defoe’s pass was mis-controlled by Aldred, allowing Arfield to steal in and finish high beyond Gillespie. It was a cruel blow against the run of play. Well then had a good chance when Hastie broke free down the right from Grimshaw’s pass and put in an excellent cross, but Tavernier secured a vital touch ahead of the onrushing Ariyibi. Hastie was causing havoc down the Rangers left and nearly broke free again after an excellent crossfield pass from Charles Dunne, only for Flanagan to recover well and clear. With off-field behaviour under the microscope in Scotland, there was to be more controversy when a lighter appeared to be thrown from a section of the home support towards visiting skipper Tavernier as he took a throw-in. And Rangers claimed their second on 39 minutes when Candeias robbed Turnbull on the edge of the Well penalty area and slipped the ball to Jack, who played in Arfield to score his second goal of the match. It took Well 12 minutes of the first half before their first chance and it was Hastie again causing the threat, cutting inside after a pass from Main, but his effort was weak and easily saved by McGregor. But it was three on the hour mark, when Arfield completed his hat-trick. The Steelmen were once again masters of their own downfall, losing the ball in midfield to Defoe, who streaked past Dunne and squared for Arfield to tap into the net. Veteran striker Defoe was still looking for a goal and was nearly gifted one from Dunne’s mistake, but Gillespie was on hand to make a good one-on-one stop before Defoe stabbed the rebound wide. Gorrin enjoyed the final act of the match when he struck a 30-yard shot well wide of the target and that spoke the truth of a day when they failed to seriously McGregor in the Rangers goal. Speaking after the match, Well gaffer Stephen Robinson commented: “We’re obviously disappointed by the result. “We really cost ourselves the game and I don’t think that there was any great play from Rangers that won the match. “It was three individual errors for the goals. “We don’t deal with the ball when we clear it in our own box for the first one when it was their first shot on target. “For the second and third goals, there is an opportunity for us to clear our lines but insteadwe try and play in an area where the risk is too high. “This season has seen a transformation in the Steelmen’s playing style, moving to trying to play more football and introduce talented youngsters to the side. 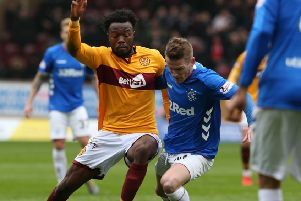 Well will hope to bounce back with fewer mistakes when they begin their post-split Premiership fixtures which will kick off with a Lanarkshire derby at Hamilton Accies a week on Saturday (April 20).